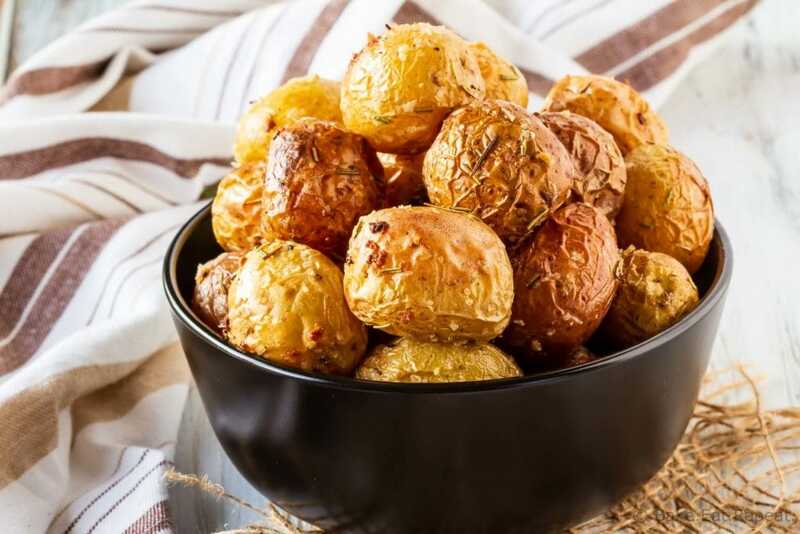 These salt crusted, roasted baby potatoes with rosemary and garlic make the perfect side dish, and it takes just a few minutes to get them in the oven! These roasted baby potatoes. They are incredible. That is all. Well….not really. I always have more to say about food then that. But sometimes that’s all I really want to say. Just “make this, it’s good” and leave it at that. Because maybe that’s all you really need to know sometimes. So….I don’t have a whole lot more to say about these roasted baby potatoes with rosemary and garlic. Except that I have been making these roasted baby potatoes for years and years and years, and they’re still my first thought when I want to make potatoes. They’re also the only way my older son will eat potatoes. And he loves them. 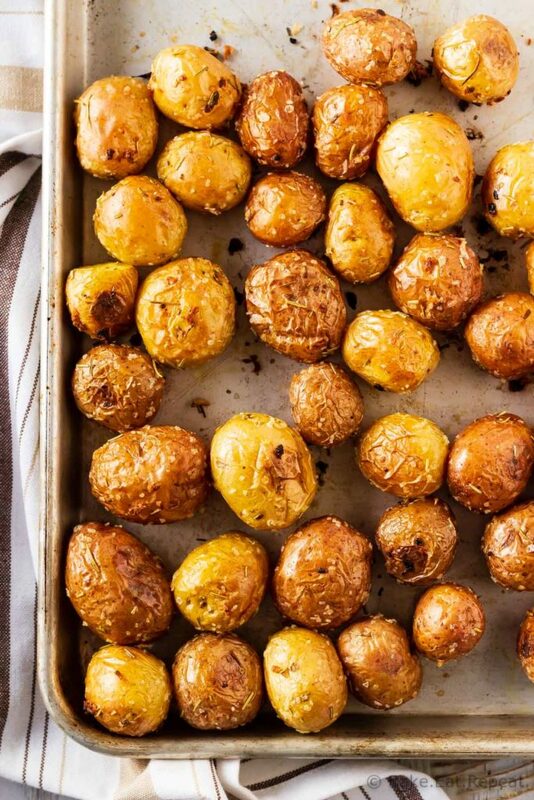 Crispy, garlicky, salt crusted roasted baby potatoes with rosemary. Make them. They’re good. How long does it take to roast small potatoes? Baby potatoes take 40-45 minutes to roast when roasted at 425 degrees F. This will give you nice crispy skins and fork tender middles. They may be soft on the inside a little earlier then that, depending on how small they are, but the crispy skins take that long. How do you cook baby potatoes in the oven? To cook baby potatoes in the oven, I like to toss them with olive oil, kosher salt, rosemary, and garlic, and roast them. 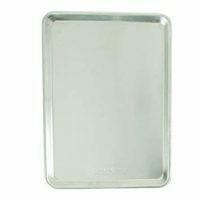 It’s super easy to cook them in the oven, just spread them on a rimmed baking sheet and throw them in the preheated oven. I usually flip them halfway through the baking time so they crisp up evenly. But I have forgotten about them and skipped that step and they still turn out great. 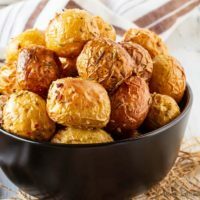 How do I make crispy baby potatoes? 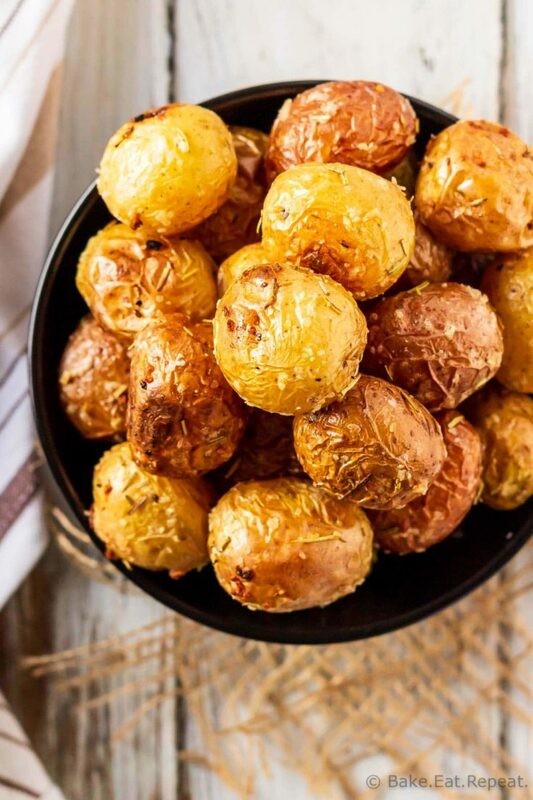 Baby potatoes will have crispy skins if you roast them at a high temperature with the skins coated in olive oil. 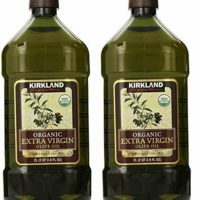 I use extra virgin olive oil, and roast them at 425 degrees F for 40-45 minutes, and this gives them nice crispy skins. You can skip the garlic if you like, and just toss the baby potatoes with rosemary and coarse salt. I sometimes make them this way and they’re delicious like this too. 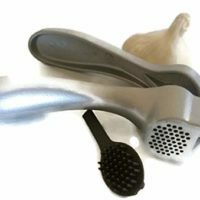 But I usually add garlic (I love this garlic press for mincing my garlic). You can replace the dried rosemary with a tablespoon of chopped fresh rosemary if you like. I usually use dried just because I always have it on hand. This recipe makes 2 1/2 pounds of roasted baby potatoes. You can easily double it or half it if you need a different amount. I find 2 1/2 pounds of baby potatoes feeds my family of five with a little bit leftover most days. Usually a good rule for baby potatoes is about 1/2 pound per person, but it obviously depends on the people eating! 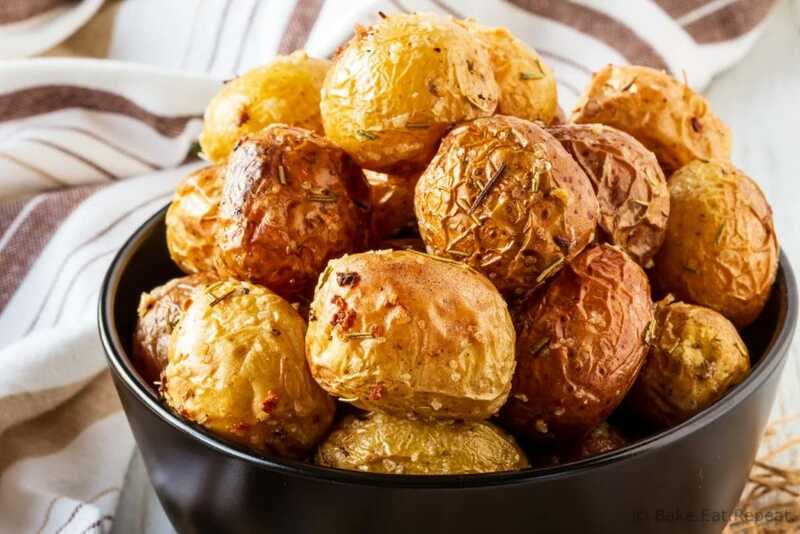 In a large bowl, toss the potatoes with the salt, olive oil, rosemary and garlic until the potatoes are evenly coated. Transfer to the prepared baking sheet and bake for 45 minutes, flipping them halfway, until they are fork tender. Serve hot. Source: Slightly adapted from Mel’s Kitchen Cafe. Roasted potatoes are the best comfort food side ever! These look amazing - love the rosemary. Thanks Rachel! I think the rosemary is my favourite part! So...yes...I am one of those potato people...which means I am loving this recipe! Sounds delicious! If you love potatoes, you will definitely love these Annie! Thanks! These look so delicious!! I can eat just these for dinner!! Thanks Ami! And thanks for stopping by! I love roasting potatoes with rosemary! I can imagine how delicious these must have tasted and how good your kitchen would have smelt when these were in the oven. Great recipe! Roasted rosemary potatoes are definitely my favourite comfort food! Love the flavours, classic and so delicious. Definitely the best potatoes of all time!!! Love the crispy, garlicky, salty flavour a little TOO much!!! Awesome recipe indeed. I love rosemary too, definitely my favourite herb! Thanks Michele! looks like a great side dish Stacey! I love potatoes so I know I will love these! These potatoes look fantastic, Stacey! I am a huge carb lover and would eat endless amounts if I could get away with it haha. Love the rosemary in here - this is such a great side dish! Thanks Kelly! I definitely eat too many of these potatoes when I make them. The crispy, salty skins get me every time! I am TOTALLY a potato person. Actually, just carbs of any kind. lol. These look SO good! I love potatoes, but I think I like bread just a little more! But these potatoes look amazing! I am so loving the rosemary flavor. And roasting them seems to make them into bite-sized balls of perfection! What a great side dish, Stacey! Thanks Gayle! I think roasting makes pretty much any vegetable about perfect. I love the crispy edges you get that way! I am kind of obsessed with potatoes. These sounds like these amazing potatoes that I was addicted to from a cafe near where I used to live. I am going to have to try them to see if they taste the same. Let me know if you like them! Thanks Dannii! What?! You aren't a potato person?? That's insanity! Actually, I'm not a huge potato person either. Haha. :) I like them a lot, but I can live without them. Same w/ bread even. But my carb vice is the sweets! Obviously! I love these potatoes though... rosemary is one of my favorite herbs. And the crispy skins - yes, please!! Hahaha, I love that you were all appalled and then admit you're not a huge fan either! :) Rosemary is my favourite herb too, I use it all the time, so good. And crispy potato skins definitely increase the yum factor!